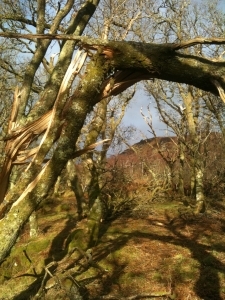 The recent storm raged through the wintry wood, blowing down trees and boughs. There’s timber everywhere at the moment. The storm that tore through Scotland a few weeks ago wrenched thousands of trees from the ground – rich pickings for anyone with a chainsaw. The other afternoon I took a walk up to the old forest to see how it had fared and to scout out the firewood situation. The casualties lay like sleeping giants, their roots dangling indecently in mid air, exposed, for the first time, to the elements. One Goliath had snapped and twisted, forming a perfect archway. Another had fallen into a dell, taking its siblings down with it. In front of me an ancient oak was on its side, creamy-white innards spilling out from the gash in its trunk. I could almost hear its life, its sap, seeping out. I sat down on a stone and listened to the muted mossy quiet of the wood, thinking how different it must have sounded on the night of the storm when the wind howled and the trees thrashed and crashed in the darkness. New shoots grow from a tree that had been blown down many moons ago. There was a note of sadness in the air, of resignation. But stronger than this was the sense of endurance – the trunks of the trees that stood were like solid fists punched deep into the ground. The sun came out for a moment, shining on the silver of a birch that had fallen into its neighbour’s arms. 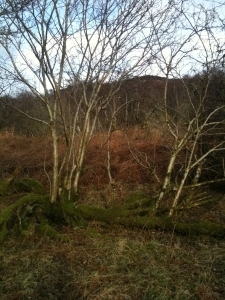 The dishevelled wood glowed and the whisper of warmth was a reminder of regeneration, of the spring that will come. I’d brought my little hand saw along with me and I worked away at a fallen bough. It felt timeless, almost magical, to be deep in the wild wood carrying out the age-old tradition of foraging for fuel. I gathered an ikea-bagful – just a gesture really – to store and season for next winter. When I got home I did a quick Google into the legality of collecting dead wood from forests. If it’s private land you need to ask the owner’s permission and if it’s Forestry Commission you apply, in some cases, for a scavenger’s licence. But I can’t imagine that collecting a handful of sticks and twigs and fallen logs to put in your fire is going to bother anyone, as long as there’s plenty left for the forest beasties to live in. When I moved to the cottage I fancied I’d collect my own firewood, driftwood from the beach and fallen branches from the woods, to keep me toasty through the winter. Ha! Not a chance. As the nights drew in and the air sharpened, I was burning what seemed like half a small forest a day. So, first lesson learnt, I ordered a load of logs. Now they’re sitting outside soaking up the rain because my wood store’s a shoogly thrown-together thing, nothing more than a discarded door resting on my compost heap. Not surprisingly, it doesn’t keep the wood dry in this drenched place. So my next job (when it stops raining) is to build a proper wood store – one that lets the air in and keeps the water out and can store a tonne of logs. Any tips welcome. 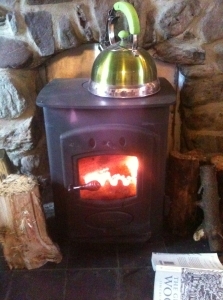 My wee wood-burning stove serves as a kettle, cooker, heater and light when the leccy goes off. I’m learning though. I’ve become pretty nifty at slicing logs into satisfying piles of kindling with my trusty axe. And I’m finding out about different woods – how they season, the heat they give off and the smell of their smoke. My neighbour felled a few birch trees last spring. It burns longer and brighter than the lemony spruce and the smell is on the edge of sweet, like a smoked oyster. Throw in a few bits of driftwood and you get a whisper of the sea. The oak that I dragged up from the beach in the summer has a fierce, unstoppable heat and the old telephone pole burns like a demon (what was it treated with?). Every now and then my auntie brings a bag of off-cuts from my uncle’s days as a joiner; the little bits of plywood and pine are as dry as a bone and never fail to stoke a damp squib of a fire. Once the fire gets to a certain state – its heart roaring and red – nothing can resist it, not even damp logs. I can’t resist it either, this gentle warmth that holds me in its purring glow. I unwind, sink deeper into my chair, maybe have a little snooze. Now, what was I saying about building a wood store?